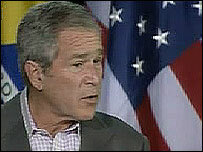 President George W Bush has condemned Iran's "inexcusable behaviour" after its capture of 15 Royal Navy personnel. The US leader added that he would "strongly support" the British government over the crisis. Iranian Foreign Minister Manouchehr Mottaki said Iran was waiting for a "change in attitude" from the UK and a "moderate approach" to its requests. Scottish Secretary Douglas Alexander has told the BBC diplomacy would continue with a "twin track approach". Mr Bush told reporters at Camp David: "The British hostages issue is a serious issue because the Iranians took these people out of Iraqi water. "And it is inexcusable behaviour. "I strongly support the Blair government's attempts to resolve this peacefully. "And I support the prime minister when he made it clear there were no quid pro quos. The Iranians must give back the hostages." His calls were echoed by German Chancellor Angela Merkel who said Britain had the "full solidarity of the European Union". Meanwhile, Mr Mottaki confirmed the receipt of a note from the British embassy about the military personnel, Iranian television reported. "This note contains many points which will be considered," he said. "However, we are waiting for a change in the attitude of the British and a moderate approach by this country towards Iran's legal requests. " Meanwhile, Mr Alexander told BBC One's Sunday AM programme diplomatic efforts would continue. "On one hand, working closely with international partners to make clear the strength of international feeling that these British service personnel should be returned," he said. "And on the other hand exploring the potential for dialogue with the Iranians." Britain denies Iran's claims that the UK crew was in its waters when seized on 23 March and is demanding their "immediate" return. BBC diplomatic correspondent James Robbins said that, although there was no sign of a major diplomatic breakthrough in the crisis, there was now a sense of dialogue between the two countries. Both sides appeared to be "lowering the temperature", he added. The Liberal Democrat leader, Sir Menzies Campbell, told Sky News there were signs Iran had engineered the crisis for political purposes. "The speed at which the marines and the sailors were captured and the way in which it happened suggests that either it had been organised before or there was a spontaneous effort made to try and get hold of some British troops for some other purposes beyond anything to do with the waters that they were operating in," he said. Tory former foreign secretary Sir Malcolm Rifkind welcomed statements from the EU and UN, but said "pressure" was needed. He told Sunday AM: "But if you are going to make threats of economic sanctions, for example, they have to be made privately because otherwise the Iranians are pushed into a humiliating climb-down." He called for "solidarity" from EU allies over possible sanctions such as withholding export credit guarantees. Meanwhile, former hostage Terry Waite, who was held captive for 1,760 days in Beirut before being released in November 1991, has offered to travel to Iran to negotiate with those holding the Britons. Mr Waite said threatening the Iranian government was counterproductive and said he would be able to "cut through some of the rhetoric". The Britons, based on HMS Cornwall, were seized by Revolutionary Guards as they returned from searching a vessel in the northern Gulf. Should captives sell their stories? Who called the shots in Iran?